AVAILABLE NOW THROUGHOUT THE SUMMER! Just a stone's throw from downtown Toronto and the trendy Beach. Our 1200 square foot lovely unit, overlooks Lake Ontario....your Home Away from Home! The suite includes both period furniture and modern amenities. We provide 3 bedrooms - a king-size, queen-size, and pull-out sofa. The living room (15' x 20') features an electric fireplace, a reclining love seat, and a book nook (for trading!). Not to mention a beautiful view of our own Lake Ontario! Other amenities include 2 flat screen cable TVs, a DVD player, and broadband-based WiFi. Imagine cooking while looking at the lake from our fully-equipped kitchen - all utensils and appliances: toaster, coffee maker, electric kettle, stove, fridge/freezer and microwave. The suite has two beautiful, spacious bathrooms and, of course, no home-away-from-home would be complete without laundry - there is a washer and dryer right in the apartment! Groceries can be purchased at one of the nearby major food chains. We are very proud of our country-in-the-city environment, just fifteen minutes drive from downtown Toronto. Feel the peace and serenity offered by our secluded paradise, the gentle lake breezes and quiet community atmosphere. While joggers and dog-walkers make good use of the neighborhood streets, often the loudest noise to be heard is the birdsong - Canada geese, blue jays, & cardinals. Raccoons, our uninvited guests, appear regularly and sometimes deer and foxes are spotted in the backyard. Your lovely apartment includes use of our spacious deck, hot tub, firepit, 2 bicycles and helmets, the daily newspaper, and free parking. Our suite is great for travellers, corporate or wedding guests and locals who want a vacation without leaving town. This vantage point is perfect for watching the sunrise, storms, and rainbows. The moon rising from the lake on full-moon nights is simply indescribable and must be experienced. Downtown is easily accessed by car or public transit. "The Beach" neighborhood is just 5 minutes away where you can enjoy exploring the very desirable neighborhood with itâ? ?s Boardwalk, beach volleyball, walking & cycling trails, off-leash area for dogs, fine dining, sidewalk cafes, shops, & spas...amenities abound! We are located a few minutes drive from Bluffer's Park Marina to the east where you can enjoy a wonderful meal or pub fare while the boats go in and out of the marina. In season, you may want to charter a boat and captain and enjoy fishing for salmon or lake trout. Our hostess made us right at home & the fridge was stocked with essentials which was so thoughtful. 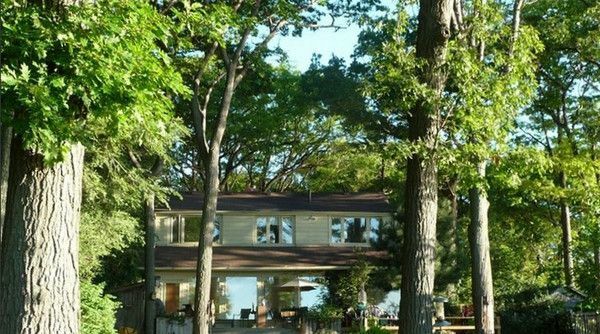 The house is a wonderful place with a beautiful view of Lake Ontario. I would highly recommend this rental for a comfortable home away from home. There are so many places to visit and everyone in the area was helpful when we asked questions. We would stay again. We found the perfect three bedroom two bath duplex for our family while attending a weekend wedding. Host provided everything we needed with a well stocked kitchen and snacks. There is a private balcony overlooking the lake. The decor was beautiful. This will be our go to when visiting Toronto! Downtown is easily accessed by car or public transit. &quot;The Beach&quot; neighborhood is just 5 minutes away where you can enjoy exploring the very desirable neighborhood with itâ? ?s Boardwalk, beach volleyball, walking &amp; cycling trails, off-leash area for dogs, fine dining, sidewalk cafes, shops, &amp; spas...amenities abound! We are located a few minutes drive from Bluffer&#039;s Park Marina to the east where you can enjoy a wonderful meal or pub fare while the boats go in and out of the marina. In season, you may want to charter a boat and captain and enjoy fishing for salmon or lake trout. $800/week: Jan, Feb, March, April, Nov, Dec.($120 /day) $1000/week: May, October ($155 / day) $1350 /week: June, July, August, September ($175 / day) $425 - 550 per weekend all year Christmas week: $800 - 1000 2-night minimum beyond 4 guests, additional charge of $10 per night per person Extra person fee of 50 per person per night after the first 6 guests.